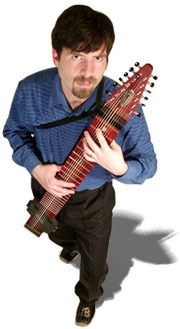 Greg Howard is one of the few full-time touring soloists on the Chapman Stick. Having played since 1985, Greg has released eight CDs and is the author of The Stick Book™, Volume I. He has also conducted Stick seminars all over the world teaching countless numbers of budding Stick players. During the month of March, Greg will be touring the eastern US with the Greg Howard Band consisting of Greg on Stick, Jan Wolfkamp on drums and loops, Hubert Heeringa on saxes, and Jan van Olffen on bass. For more details, visit www.greghoward.com.